Here are some facts about Henri Rousseau, the French artist. Henri Rousseau was born in Laval in Mayenne, France on 21st May 1844. Henri’s father was a plumber. Rousseau went to high school in Laval, his home town. He was an average pupil, although he did very well in art and music lessons. After he left school, Henri worked for a lawyer and then he joined the army, serving from 1863 to 1867. His father died in 1868 and Henri Rousseau moved to Paris to take care of his mother. He worked as a government official and then he became an import tax collector. Rousseau married Clemence Boitard, the daughter of his landlord, and they had six children. Unfortunately, only one survived beyond childhood. Clemence died in 1888, and Rousseau married his second wife, Josephine Noury, in 1898. Henri Rousseau only started painting seriously when he was in in his forties. He was a self-taught painter and, as a result, his work is often described as naive or child-like. 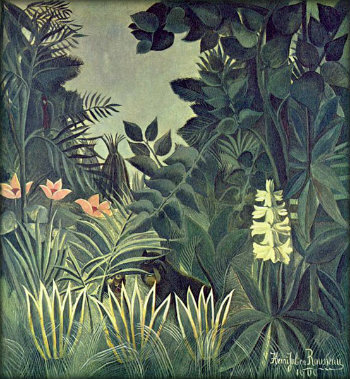 Rousseau became a full-time artist at the age of 49. He was an accomplished violin player, and he often supplemented his income by playing as a street musician. Although some of Rousseau’s most well-known paintings are of jungle scenes, he never set foot in a jungle. Instead, he took his inspiration from the Jardin des Plantes (botanical gardens) in Paris and illustrations in books. Pablo Picasso was an admirer of Henri Rousseau and he held a banquet to honour the artist. Rene Magritte was also impressed by Rousseau’s work. Henri Rousseau died on 2nd September 1910 in Paris. He was 66 years old. 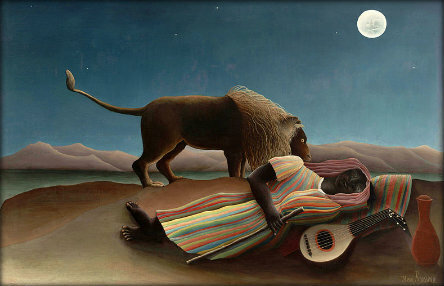 Some of Rousseau’s most famous paintings include: Tiger in a Tropical Storm, The Hungry Lion Throws Itself on the Antelope, and The Sleeping Gypsy. This page has proved very useful to me. Mr rosseau is really intersting. You are right! This site was very helpful! He is an excellent artist and these facts are really useful. agree with all of the above comments so useful for homework, no matter what year your in. very useful. great facts for my art homework! These are very useful for my art hw, thank you! I have started a topic on Henri Rousseau at school in art and found this website incredibly helpful when finishing my introduction page. This website really helped with hw! It’s great!